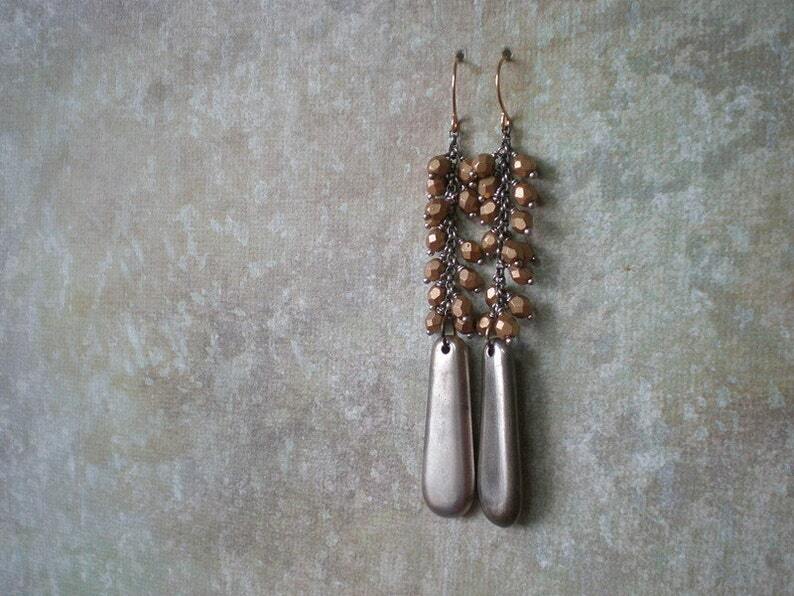 These long cascade earrings are special to me because I found the oxidized, silver plated acrylic distressed teardrops on the dusty, neglected third floor of a Tel Aviv bead shop many years ago. I sold a few pairs and then recently went back to see if they had more. Lo and behold I found a few more and grabbed them! I've topped off the long teardrops with a lovely cascade of gold matte glass beads (bead shape may vary but will be gold matte like in the photos), which I've wire-wrapped onto an oxidized rolo chain. It all hangs from a gold-filled ear wire, about 3 inches (7.5 cm) from the hole in your lovely ear. I love the mix of metal colors and I think you will too. Yes, you can request them shorter! Prefer Earrings with Rings and Hoops?